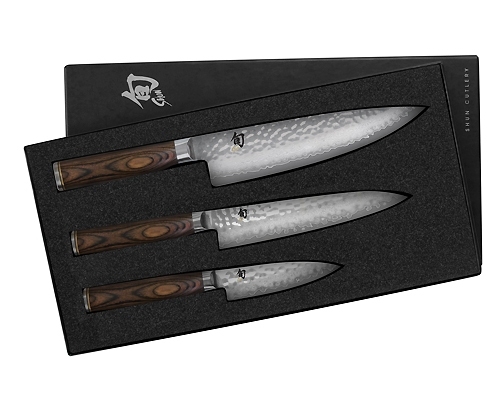 The Shun Premier Knife Collection features a striking hand-hammered appearance (Tsuchime) that is a great melding of form and function. The mottled surface provides air pockets to reduce drag when cutting and helps to keep starchy foods from sticking to the blade. The signature Shun emblem is emblazoned on the blade and on the end of the handle. 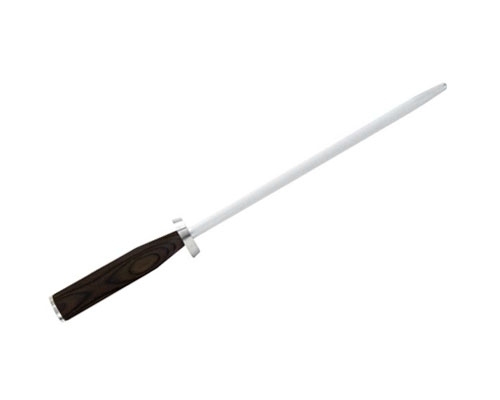 The handle is a dark, walnut PakkaWood; A resin impregnated wood that is impervious to water and will not shrink. 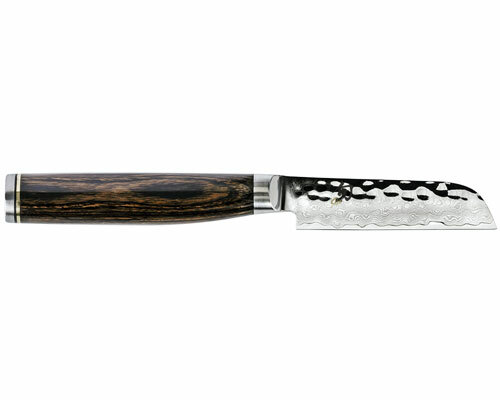 Each Shun Premier knife has a VG10 core, with 16 layers of Damascus on each side, for a total of 33 layers. The edges are razor sharp and very thin, as you would expect from Shun. Lifetime guaranteed. 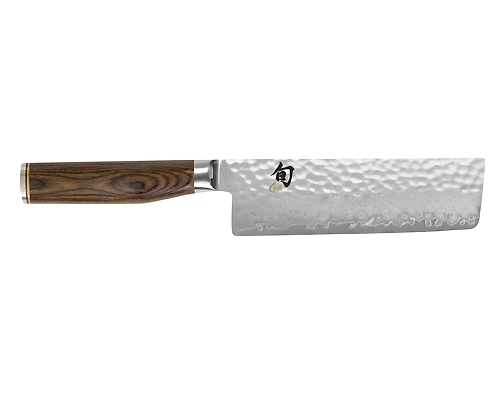 The Shun Premier 4 in. 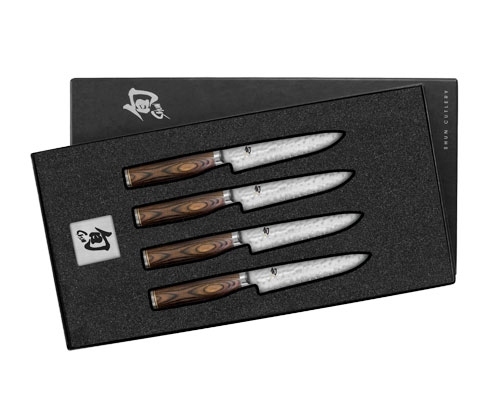 (100mm) Paring Knife is ideal for coring, peeling, trimming, decorating, and other detailed work. 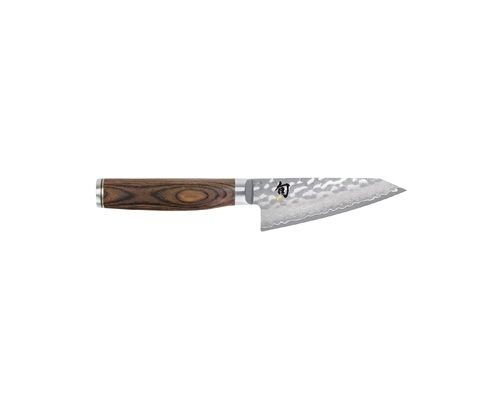 The Shun Premier 6.5 in. 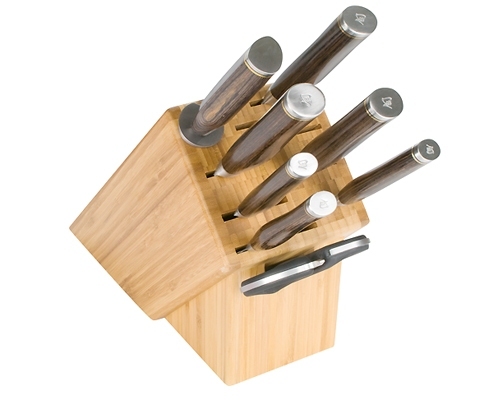 (165mm) Utility Knife is perfect for a multitude of small tasks where more precise cuts are needed, such as trimming broccoli, green beans, or other smaller vegetables. 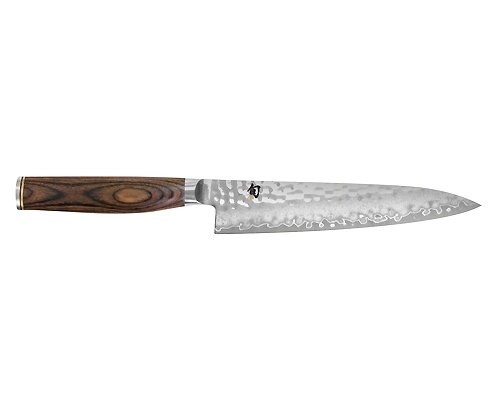 The Shun Premier 9.5 in. 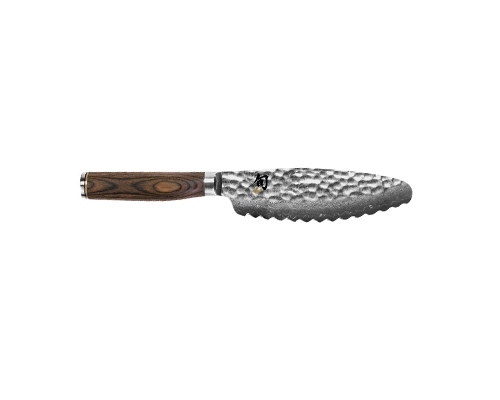 (240mm) Carving Knife has a long, narrow blade enables you to make a cleaner cut, which helps keep more of the juices and flavor trapped in the meat. 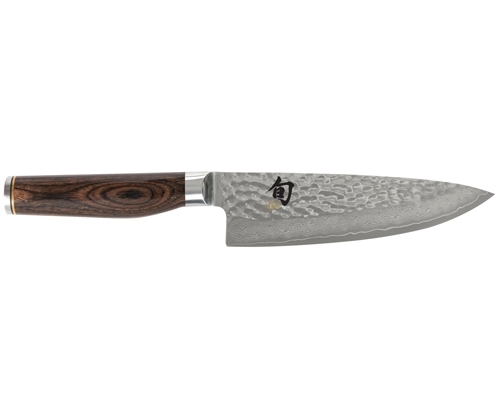 The Shun Premier 6.5 in. (165mm) Carving Fork is an elegant match for the Shun Premier Slicing or Carving knife, this two-pronged Carving fork easily holds food in place while slicing or carving and assists in serving, too. 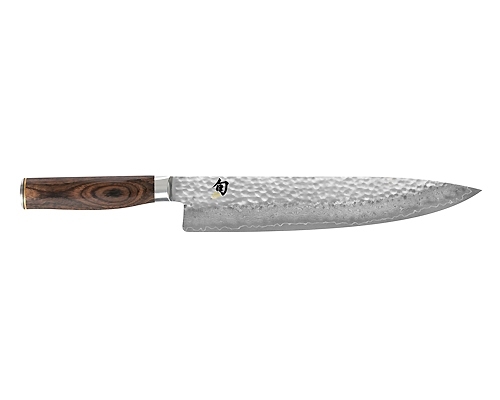 The Shun Premier 3 in. 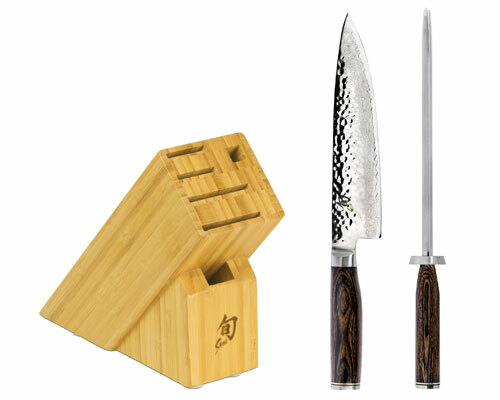 (75mm) Kudamono Paring Knife is ideal for coring, peeling, trimming, decorating, and other detailed work. The Shun Premier 6.5 in. 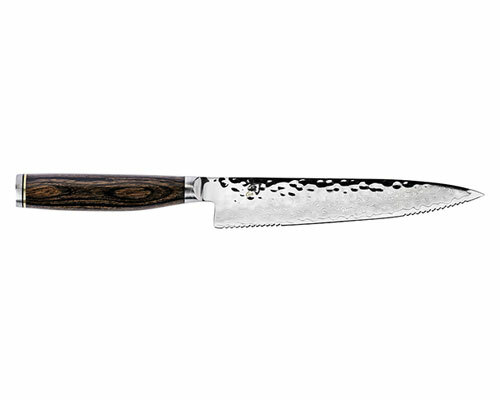 (165mm) Serrated Utility Knife is excellent for slicing tomatoes or any of your vegetables or fruits. 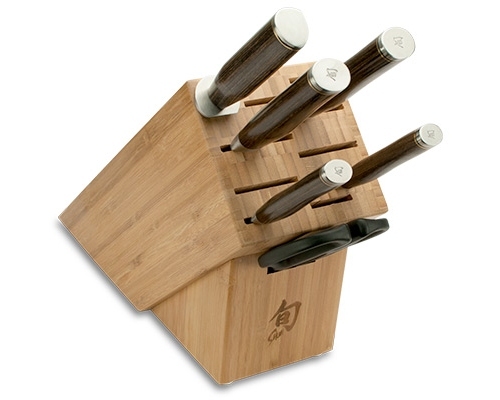 This unique knife is a top-seller for Shun and seems to be a big favorite in the home kitchen. 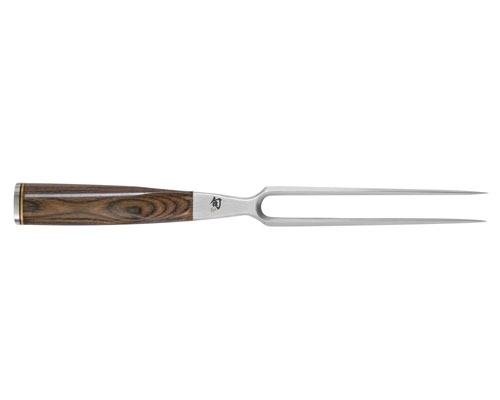 Comparable to a panini knife, the smooth serrations glide through meat and crusty breads without tearing the product. 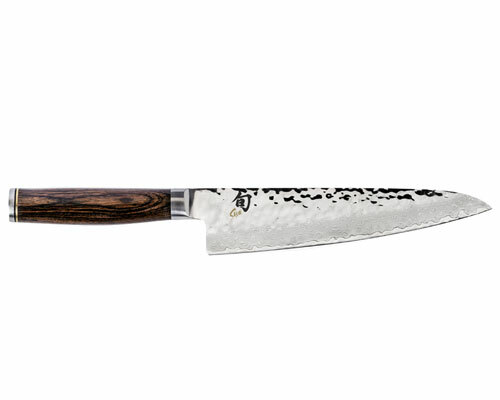 The Shun Premier 8 in. 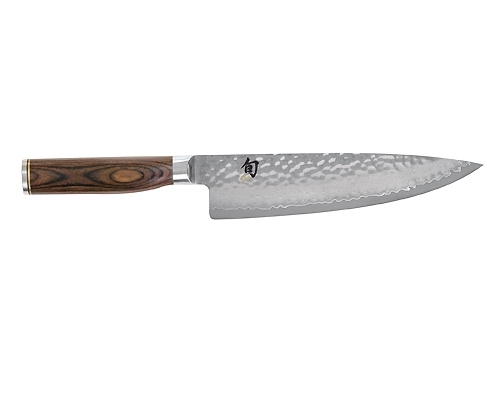 (210mm) Kiritsuke is an all purpose kitchen knife that can be used just like a chef's knife or gyuto. The thin blade makes it easy to slice, dice, mince and chop. 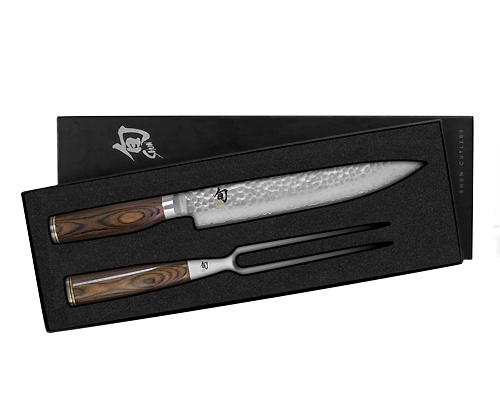 The hammered finish helps prevent food from sticking to the blade. 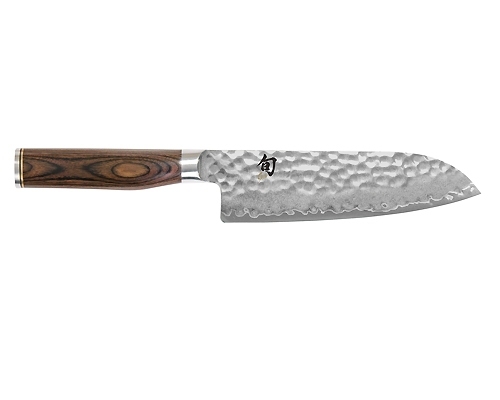 In Japan, owning a kiritsuke is the sign of being a master chef. 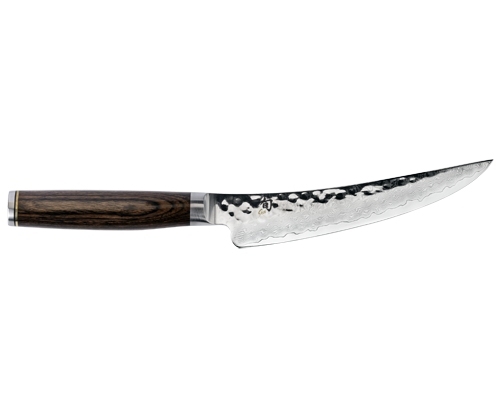 A skilled Japanese chef can handle any do almost anything with this knife. 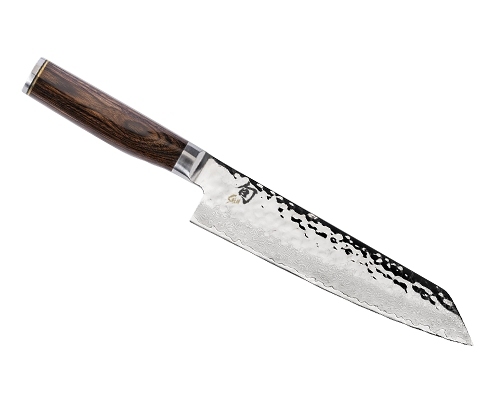 The Shun Premier 6 in. 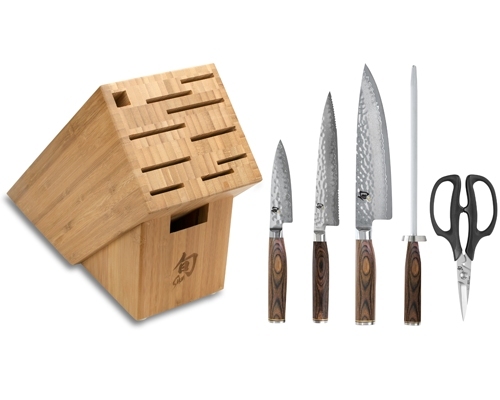 Gokujo Boning/Fillet Knife is a departure from traditional shapes. While it can still be used for breaking down poultry, frenching ribs, etc., it really excels at removing silver skin from tenderloins and legs of veal or lamb. 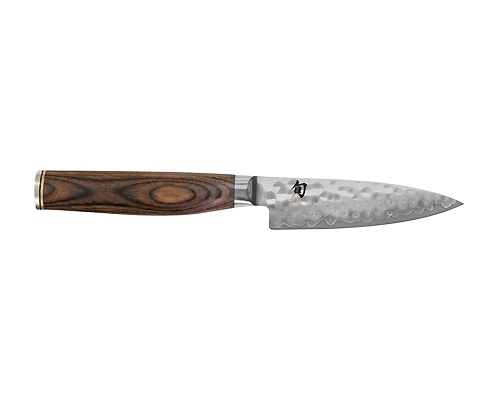 Handcrafted with 68 layers of Damascus cladding and a Walnut PakkaWood handle this knife is ideal for controlled cutting.